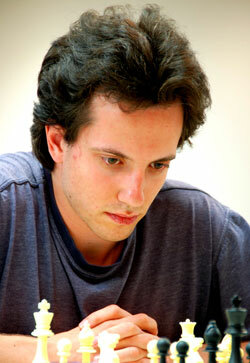 Shabalov defeated Josh Friedel in a better endgame that came out of an exchange Ruy. Kritz's biggest win so far was against Justin Sarkar. The final position was actually a draw, because Black can simply hold on with Kg7 or a5. White cannot capture the d4 pawn or Black will invade from behind and actually win! For instance, 36...Kg7 37.Kf4 Kf6 38.Ke4 Kg5 39.Kxd4? Kf4 40.Kc5 Ke3 41.d4 Kd2 42.d5 Kxc2 etc. James Critelli's (2262)performance is also worth noting. After a slow start of .5/2, Critell won three games in a row including victories over David Pruess (2422) and Daniel Rensch (2400). Against Daniel Rensch, he played a main line Najdorf and ended up with most of the play. Note that 28...Bg5 was an important in between move. If Black had just taken the pawn on c4 immediately, White would get too much play on the c-file as compenstion.